Contest: Win ‘Braveheart’ and ‘Gladiator’ on 4k Ultra HD Blu-ray! Paramount has been very generous to High-Def Digest readers lately. While we finish tallying up the results of last week’s ‘Saving Private Ryan’ contest, you’ll get a chance this week to win a prize pack of the Oscar winners ‘Braveheart‘ and ‘Gladiator‘ on 4k Ultra HD Blu-ray. We have two copies of each movie to give away. The winners will be chosen at our own subjective discretion based on whichever responses we enjoy the most. Entries are limited to 10 per person. That should give you plenty of opportunity to craft a good submission, but will also help us to avoid any potential appearance of awarding prizes based on volume rather than quality. (Please heed this limit. You will be taken out of consideration if you submit more than 10 entries.) All entries must be submitted in the Comments section of this blog post. Please do not attempt to email them to me. The deadline for entry is end of day on Sunday, May 20th. The winners will be announced the following week. Good luck! See? When you won’t shave your arm pits, we have to resort to drastic measures! I just wanted to recreate my favorite Michael Jordan Poster! that’s all! Why won’t you just let me murder our families and sleep with my sister and move on? If you won’t stop yourself from doing Meg Ryan’s next movie then you leave me no choice! Your tan is coming along nicely..
Now, where are you most ticklish? Your crane technique will not affect our staring contest! Narrator : And yet that night he got drunk and chained up by a girly man. If you want to wear threads as nice as these, we’ll need to atrophy your arms for about a month, no activity allowed! Russell Crowe: Nice cape fanboy! 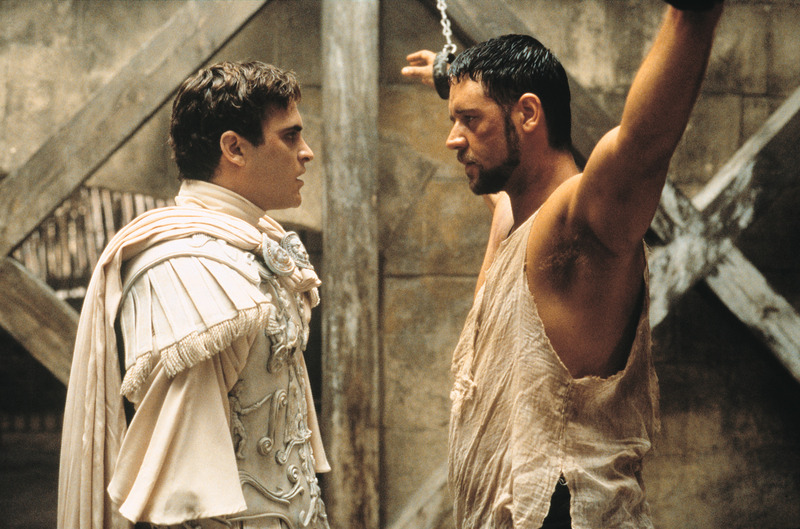 Commodus: Have you seen my dragon? Have you ever heard of underarm deodorant? I swear, I didn’t say Trump is smarter than you! Well by 5:30 your pits will be dry. What this old thing? It’s Dior 35 B.C. spring collection. But you!!! You’re positively Jerusalem 33 A.D. CHIC!!!! Ok Mr. Grey, lets do this! Oh look, Commodus made a scare ‘Crowe’! You have committed a crime to make the mummy remake. Is it true that your Jock strap is in a Blockbuster video in Alaska?